"If you don't want to go back - don't." Gravitas Ventures has debuted a trailer for Diane Bell's new film Bleeding Heart, starring Jessica Biel and Zosia Mamet as estranged sisters. The film is about a yoga instructor, played by Jessica Biel, whose sister suddenly comes into her life. But it turns out her deadbeat boyfriend is kind of crazy, and then it turns into an intense chase thriller, or something like that. The full cast includes Joe Anderson, Edi Gathegi, Kate Burton and Exie Booker. This honestly looks pretty bad, and I'm only posting this just because it's getting a theatrical release anyway. If you're interested, take a look. 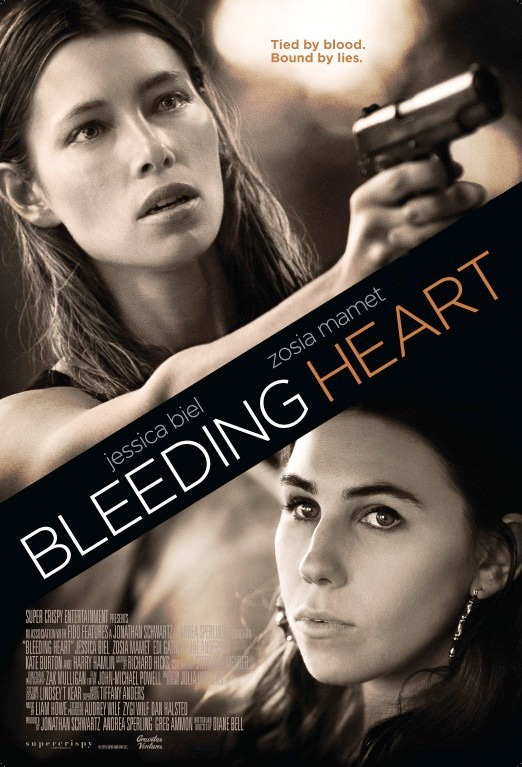 Bleeding Heart follows the story of May (Jessica Biel), a yoga instructor who finds herself behaving in ways she'd never imagined herself capable of in an effort to protect her newly discovered biological sister, Shiva (Zosia Mamet), from a dangerous boyfriend. Bleeding Heart is both written and directed by filmmaker Diane Bell, of the film Obselidia previously. The film premiered at the Tribeca Film Festival earlier this year. Gravitas Ventures will release Diane Bell's Bleeding Heart in select theaters starting December 11th. Interesting. But I think I shall pass.